Chocolate zucchini banana bread is dense and moist. 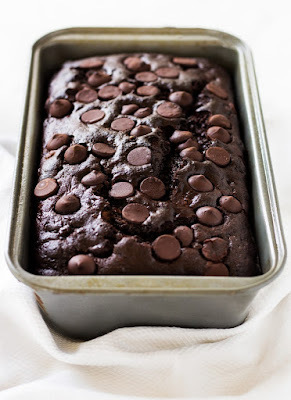 Filled with chocolate chips, it’s the perfect bread to eat any time of day! Preheat oven to 350° F. Spray a 5x9 loaf pan with non-stick spray, set aside. In a medium mixing bowl, whisk together cocoa, flour, baking soda, baking powder, salt and cinnamon. Set aside. In a large mixing bowl, mix together oil, vanilla and both sugars. Stir in eggs, bananas and shredded zucchini. Stir until well combined. Fold in dry ingredients just until combined. Fold in chocolate chips. Pour batter into prepared loaf pan and bake in preheated oven for 45 to 60 minutes until a toothpick comes out clean with a few moist crumbs sticking to the toothpick. Remove from oven and let cool completely. Slice and serve. Store covered at room temperature. 0 Response to "Chocolate Zucchini Banana Bread"